While wood decks are a classic look in home design, they can easily be affected by inclement weather, moisture, and wind in winter storms. The warmer weather of spring means that it is now more time to enjoy your beautiful wood deck. However before you use it, you may want to show it a little TLC prior to entertaining in the spring and summer months. While wood decks are a classic look in home design, they can easily be affected by inclement weather, moisture, and wind in winter storms. 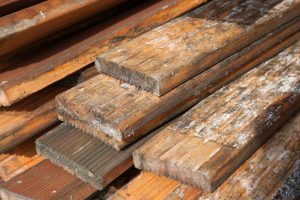 If you’re looking to get your deck back in shape for spring, consider this three step maintenance process for bringing your wood deck back to life. If you notice any damage or potential damage to your deck, now is a great time to repair it before entertaining for the season. Repair cracks, splinters, or missing parts with the help of a professional to keep your deck looking great into the summer. The sooner you catch damage in the season, the easier it is to repair and prevent further damage in the future. Winter weather can take a toll on your wood deck, so be sure to clean it thoroughly after making any necessary repairs. Sweeping, brushing on a deck cleaner, or pressure washing are the best ways to keep dirt, dust, and pollen off of your deck before sealing it for the spring. After a good cleaning, you will almost immediately notice the results with your deck looking good as new. Seal your deck to ensure that it is well protected from moisture, storms, and fluctuating temperatures throughout the season. Not only will sealing your deck protect it throughout the spring and summer months, but it will also extend the lifespan of your deck and prevent further damage in the future. A seal will also give your deck a beautifully polished look for entertaining, so you can be proud to show off your deck for any spring or summer occasion this year. Mid-Atlantic Deck & Fence has almost 30 years of experience in building beautiful custom fences, gazebos, screened-in porches, and decks throughout the state of Maryland. We have the expertise to design your dream fence or custom deck and have it installed in a headache-free process. Give us a call at 1-800-833-9310 or visit us online for a quote today! We offer many different styles of fencing and decking in addition to custom options designed specifically to suit your preferences and tastes. To see examples of our work and get more tips on how to choose the right gazebo for your family, follow us onFacebook, Twitter, Houzz,Pinterest, Google+, YouTube, and LinkedIn.